The 'Swan' is listed in the Universal British Directory (published between 1790 and 1798), with Joseph Slayter named as Victualler. 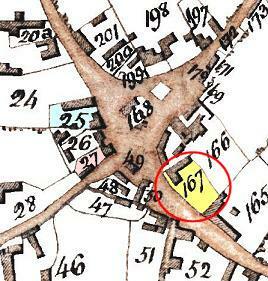 The 'Swan Public House' is also shown on the 1796 Enclosure map as plot 167. Its owner then was Thomas Meacher. Thomas Meacher is also recorded as the owner of the 'Rose and Crown public house', plot 27. This was only a few yards away from the Swan at the corner of Water Lane where Virginia House Stores is located today (which was not built until 1857). Next door but one to that, Plot 25 on the map, is the 'Crown and Castle' building, but this is simply recorded as 'Cottage and garden' (owned by Thomas Odell) on the 1796 map, rather than a public house. However, by the time of the 1830-1 Pigot Directory the 'Crown and Castle' was competing with the Swan and the 'Rose and Crown' is not listed. It is not known when the 'Rose and Crown' first opened or when it closed. Perhaps the business simply moved two doors away at some point. It is also not known if Thomas Meacher was the actual publican at either of his two pubs - he may have been an absentee landlord. However, he was allotted a small field further up the High Street (Plot 10) as a result of the enclosures. The trade directories published between 1790 and 1939, together with the censuses from 1851 to 1901, provide some details of the Swan's publicans and their families over this period. Joseph Slayter 1790-8 (Universal British), 1790-8: Joseph Slayter is named as Victualler. The St Laud's Marriage Register records a Joseph Slatyer marrying Elis. Baxter on 12 December 1774. The St Laud's Burials Record lists an Elizabeth Slayter (born in Newport Pagnell) being buried on 22 June 1823 aged 79. There are various Slaters, Slayters and Slatyers in the cenuses and parish registers. George Sharman 1899 (Kelly) In the 1891 Census, George Sharman, age 37, born Turvey (with wife Alice age 26 born Newton Abbot, Jersey, daughter Alice age 4 born Kempston, and son George age 2 born Turvey) is recorded at the Royal Oak. In 1895 (Kelly) he is listed as a Beer Retailer. They appear to have moved from the Royal Oak to the Swan after that date, but he died before the 1901 census, leaving his widow. Note: there are some inconsistencies in the census data. At present, it is not known if some of these may just be transcription errors, due to difficulties in reading the handwriting, or if they were in the original. 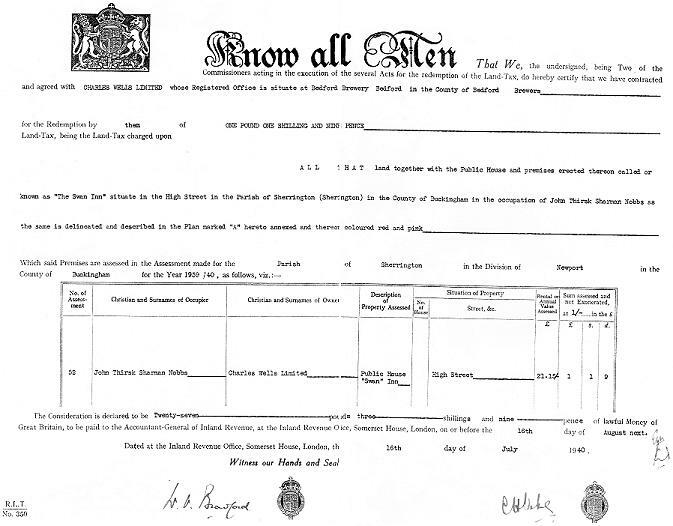 The Land Tax Redemption certificate dated 15 July 1940 shows that Charles Wells were the owners and John Thirsk Sharman Nobbs was the occupier at that time. The 'Rental or Annual Value Assessed' was £21 15s 0d. The 'Sum assessed and not Exonerated', i.e. the Land Tax, was £1 1s 9d. During the late 1960's the building was re-furbished by Charles Wells. A major change was the new roof which resulted in the removal of the third storey and the dormer windows, which are clearly seen in all the older photos (e.g. that on the left which dates from 1926). The photo on the right was taken in October 1997. Bill Norton ran the Swan with his wife Pip for 10 years. He was also chairman of The Licensed Victuallers Association. His regulars clubbed together to buy a seat in his memory. Click on the thumbnail on the right to read the local newspaper article. Charles Wells closed the Swan at the end of business on Sunday 8 February 2009. A campaign was launched by villagers to 'Save The Swan'. 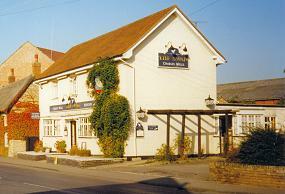 In December 2009, the Swan re-opened under new management as a Free House. However, it was not financialy viable and it closed again in November 2010. Milton Keynes Council granted planning permission in May 2011 for conversion to a private residence. Click on the thumbnails to see larger size copies of the photos. The first photo shows the Swan in 1926. The second shows a group of carol-singers outside the Swan, possibly in the 1960's. The Swan is also visible in some of the archive photos showing general views of the High Street.